We have 4 real ale pumps with 2 regular ales and 2 guest ales weekly. If you have any suggestions, please email us and we would be happy to see if we can stock your suggestions. In 1980 the art of making beer returned to the old brewing town of Wiveliscombe when Exmoor Ales, or Golden Hill as it was known then, set up its mash tun in the former home of Arnold & Hancock. Since then, the brewery has remained one of the most successful of the first wave of British microbreweries. To mark this momentous milestone, the brewery has released Exmoor Antler, their first new beer since the launch of Silver Stallion in 2005. Dark amber in colour, it's a beer that has a lot more bite and character than its 4% abv (alcohol by volume) might suggest. As for what went into the brewing recipe, head brewer Adrian Newman will only let on that 'we used a blend of four different malts and four hops'. Though he does admit that for the first time ever he used the American hop Cascade, a well-regarded hop that offers floral and spicy aromas on a finished beer. 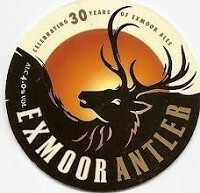 According to Exmoor's Managing Director and owner, Jonathan Price, Exmoor Antler originated 'because we wanted a darker beer that we felt was lacking in our range. Likewise we felt that a 4% beer was also missing. As for the colour, there was a feeling that golden/blonde and IPA styled beers now so over represented, that perhaps the man at the bar would welcome something different. What Adrian has created certainly seems to have done that judging by demand from our customers. St Edmunds is a fresh, golden beer with a citrus finish, brewed using pale malt and cascade hops. Crafted for modern tastes using traditional brewing methods, this is the perfect introduction to real beer. 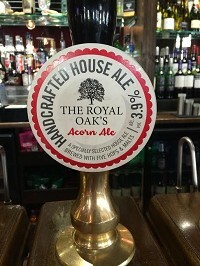 The Royal Oak's Acorn Ale is an excellent balance of sweetness and bitterness that combines with a subtle hop character, a distinctive beer with a full and satisfying finish.